Small and portable hand powered coffee grinder. The removable handle on this hand-powered mill grinder makes it the perfect portable coffee grinder for travel or camping. 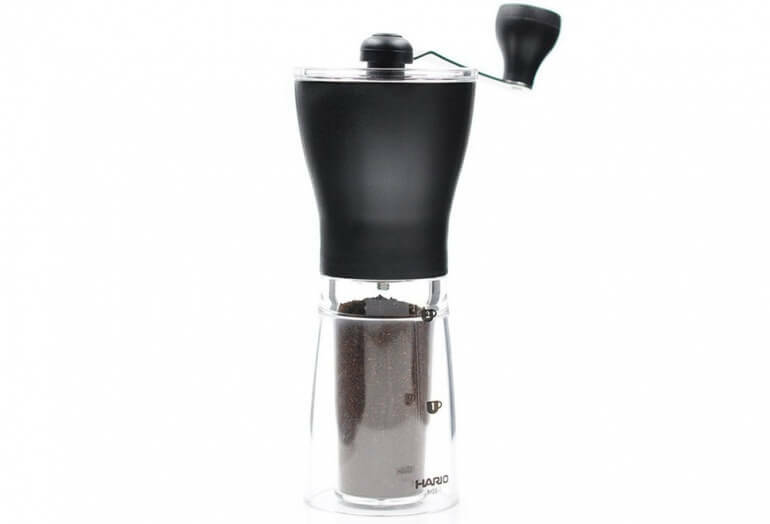 The Coffee Mill Slim is a small format hand-powered coffee grinder from Japanese company Hario. The coffee grinder features a detachable grind handle which makes it perfect for use on the road. Sturdy construction means that this unit will last even with significant use. The grinder holds 24 grams of freshly ground coffee - enough for brewing two cups. At just over 7 inches tall, this grinder is perfect to bring on trips, to hotels or even camping. Hand powered means you can brew coffee from fresh ground beans no matter where you go. We bring our portable grinder whenever we want fresh coffee or espresso while travelling. Press coffee maker in a travel mug. Brew & enjoy. True all-in-one mobile coffee brewer and thermos.